Rapid Application Development for Excel (RadXLA) is a toolkit designed for Rapid Application Development (RAD) in Excel. Rapid Application Development for Excel can convert any spreadsheet into a highly professional and elegant spreadsheet for publishing and presentation purposes. The Excel VBA add-in tools enable developers to add splash screens, progress bars and professional error handling. Rapid Application Development for Excel also reduces development time and improves the development process with easy to use tools for source code control and integration. Add professional splash screens and progress bars. Manage and log VBA errors easily and professionally. 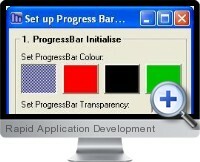 Instantly enhance the user experience and interface with graphic development tools. Significantly reduce development time with VBE Project source code tools.